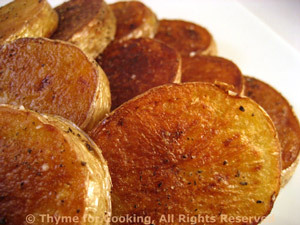 Fried Paprika Potato Rounds, simple potato side dish, Thyme for Cooking. Rather than baking these chips, I sautéed them. They get a bit more crisp, and it's easier to add seasonings as they cook. Cut the potatoes into thick slices, app 1/3" (1cm). Heat oil over medium heat in a large, nonstick skillet. When hot add potato slices, placing each flat. Sauté until lightly browned, 10 - 12 minutes. Sprinkle with 1/2 tsp paprika, a bit of salt and pepper. Turn. Sprinkle the browned side with paprika, salt and pepper. Carefully sprinkle the Worcestershire sauce between the potatoes, so it gets into the skillet, not on top. Shake the potatoes a bit to distribute, then allow to brown, another 8 - 10 minutes. When nicely browned and done, remove and serve.